When my children were at school someone came home with this as an idea for making Christmas decorations for the tree. They were really easy to make so I thought I would share them with you. Now if you are older and a bit more dexterous and love snowflakes and hexagons and all six-fold things as my elder daughter does, since she shares many of my enthusiasms, then you decide to make them like this. These are all left from the ones we made years ago. You can maybe see how to make them but I will include some instructions anyway. All you need are cocktails sticks and some spare yarn. It’s a good way to use up those tiny oddments that are too small to do anything with. You cross the two (or three) cocktail sticks together, tie the yarn to one of them near the crossing point then wind round and round going over and under each of the arms in turn and keeping the yarn taut but not so much that it distorts the shape. When you want to change colour, just tie on a new piece and pull the knot to the back so it gets hidden. I hope this shows how to wind the yarn round. And how it looks on the reverse. I have wound round the initial tail and then cut off what shows. Tie the yarn through itself round one of the arms to finish. Tying it twice probably makes it more secure. If you have some gold yarn left from making stars for Christmas cards 🙂 you can include that. And this is the reverse before the ends have been trimmed. I made this fairly quickly. With a little more time it can be even neater. It is easier if you cut off the ends as you go. And here are a few more samples. I think the rainbow one is a bit irregular because I undid some bits I had crocheted to use the thread. I thought I would also share with you some of my favourite tree decorations. There are these that my eldest daughter bought me at different times. As you can see the one on the left is larger than the normal tree ornament. It is an imitation snowball covered with down and is getting a little past its best but I love it. The other is a tiny glass angel. and I decided to give you a closer look as it doesn’t show up very well in the other photograph. Here are some wooden decorations. The one on the left was a present from a friend but the others were carefully chosen by me. The middle two come from a Christmas Market in Aachen, Germany and the one on the right from Bethlehem. I am also very fond of these. The ball I have had a long time and I think it came from John Lewis in London, and I love it for the rainbow colours that shimmer inside but don’t show very well in the photograph. The other I bought in Southampton a year or two ago from a stall in the precinct. They had lots and lots of similar ones and I bought this one because blue is my favourite colour. Now we move on to some that I think have creative possibilities. These are both made from wire but offer possibilities for being copied. The one on the right could maybe be made with a wire star shape and yarn wound round it with added beads or buttons. I might try something next year. And these I bought on Saturday in Paperchase for £6. 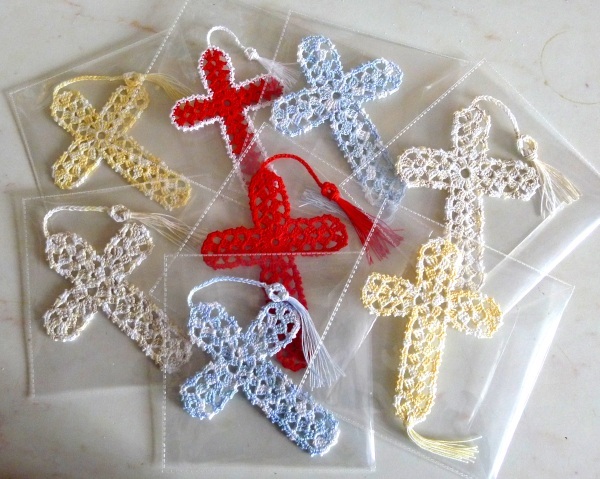 I thought I could use them to work out some suitable crochet patterns and make some for next year. Not exactly a tradition but we do like things that mean something or have special memories among the normal lights and baubles. I love these little yarn decorations! This post reminded me of making them as a child – sometimes with Popsicle sticks. I like these better, much more delicate looking! Thank you for sharing! Maybe you could make some with your children. Well there’s alway’s another year. There’s so many things one can do with children. It is all good. Previous Post CAL 40-42 Are mistakes creeping in? Next Post CAL 43-45 Lost in action!